I’d been to Paprika a couple of times before, and the experience being good on those occasions, it seemed the perfect place to head to for a Sunday brunch with the family last week. 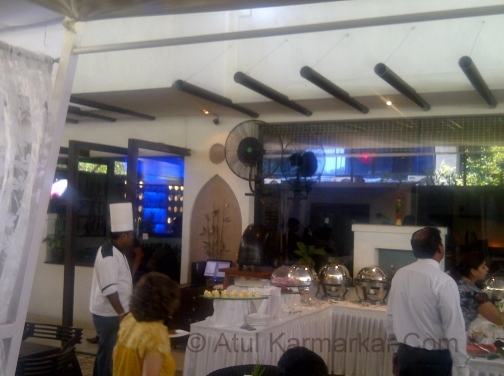 The place itself is done up well and has quite a cool, mediterranean look and feel about it. There is lots of white colour everywhere, and those curtains do a good job of being part of the decor besides offering a degree of privacy. Seating is both outdoor and indoor; the former is a sit-out with hard back wooden chairs and the latter has a lounge seating. We chose to sit out as the buffet spread was placed outside, and it seemed reasonably pleasant at the time. 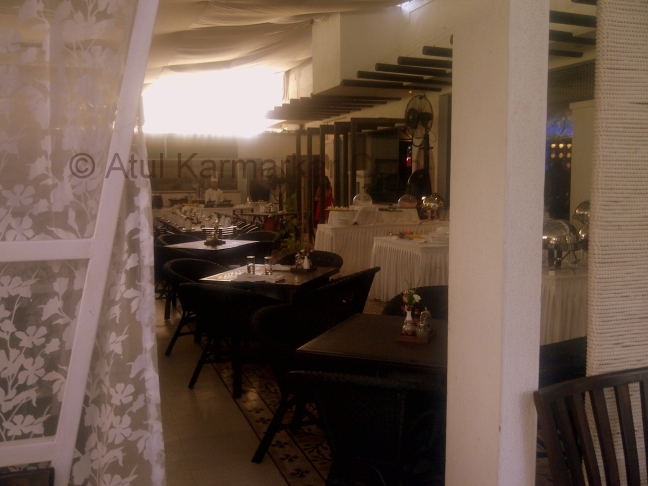 The Sunday brunch costs Rs.450+taxes (Unlimited, without alcohol) and Rs.650+taxes (Unlimited, with alcohol). Dad, Mom and Sis went for the former and bro-in-law and me chose the latter. For my 3yr old nephew, we decided on some pasta, which was being custom-made at the counter towards the far end. Sis ordered a mocktail and bro-in-law and self decided to start with a glass of red wine each (Nine Hills Shiraz). The other alternative being beer – and only Kingfisher. The spread was quite varied and a feast for the eyes. The chicken kababs were succulent and mouth watering. 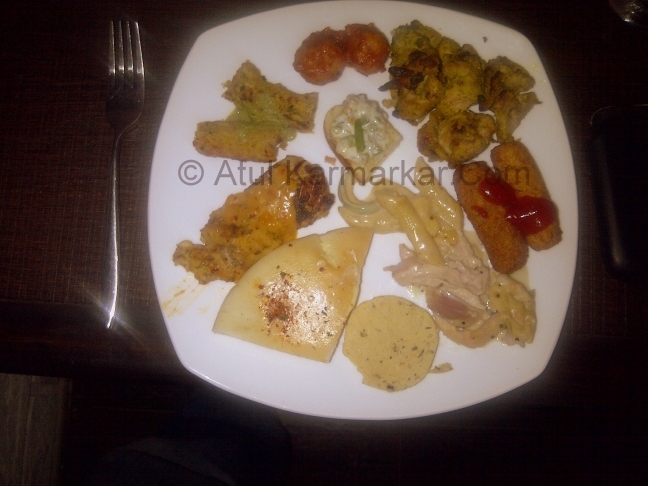 There were corn croquettes, meatballs in tomato sauce, pita bread, hummus, chicken terrine, lasagna, morrocoan fish stew, malvani chicken and some veg stuff that I didn’t really notice much. The roast chicken salad was good too. The food on offer was excellent and I really liked the variety – a mix of Indian, Continental, Mediterranean (mainly Lebanese, Italian, Spanish) and we all went back for seconds. The choices for dessert weren’t really all that great, and as they were placed outside, a lot of the cream and icing from the pastries was becoming watery and close to melting. No doubt the portions were being replenished – but not at the rate at which we’d have liked them to be. 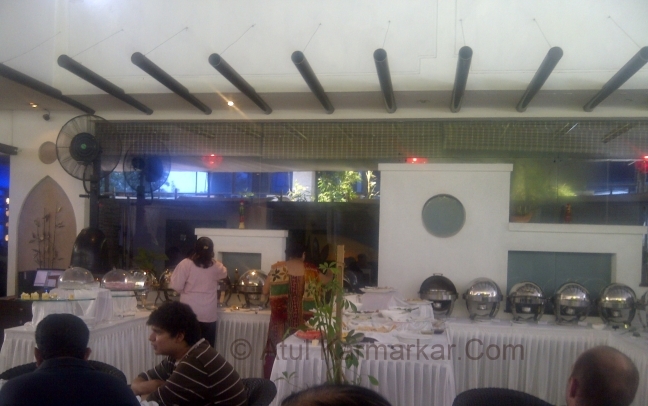 There were flies hovering around the buffet table and parking themselves on the desserts – which were kept uncovered. The fans were placed too high, and one wasn’t revolving – causing us a fair bit of discomfort. I recall them being placed slightly lower the last time I was here. One of the fans was placed in such a manner that when it revolved, most of the air was being directed outside the seating area, and the staff didn’t seem to know how to fix that or point the fan our way. The pasta counter was kind of DIY types and at the time of placing the order, sis asked for penne pasta (easier for my nephew to eat), as well as broccoli and other ingredients. Instead, we were served farfalle, or “butterfly” pasta, and capsicum, which my nephew dislikes. Reason – both weren’t available, which should have been told to us upfront. Then, when sis ordered a mocktail for herself, she said she didn’t want any ice – but ended up getting one with three ice cubes in it. It was getting pretty warm by this time so after I finished my glass of wine, I decided to cool off with a beer (no gyan please about not mixing drinks :-p ). The steward completely forgot about the order and it took 15 minutes and a reminder before he finally brought it. Lastly, we were quite surprised to get a bill for SIX buffets instead of FIVE – pretty careless, and which again took around 15 minutes to rectify.